3/04/2011 - Paradise Maiden is the love-child of Llanowar Elves and Birds of Paradise that I would argue is more or less inevitable. That's not what prompted her creation though: This is another card inspired by art. Here's the twist though, it wasn't really a top-down design. I've noticed some confusion recently about the difference between top-down and bottom-up design. Top-down design is finding a mechanical expression of a thematic concept. A top-down design challenge will always take the form "What would a unicorn look like as a Magic card?" or "What would a dragon look like as a D&D monster?" 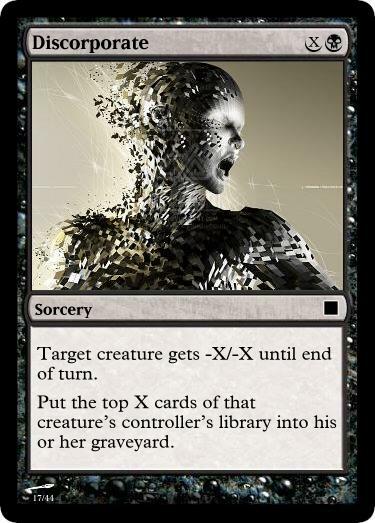 The goal is to express the concept in the terms of the format such that the resulting card/stats/entity is evocative of the original concept to players familiar with the format. Bottom-up design is the opposite. The designer seeks to find a thematic expression of a mechanical concept. 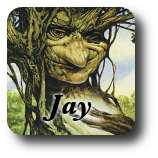 In the case of a team like Wizards of the Coast, one person might just design the mechanic and leave the creative portion to another, but ultimately both are necessary for the completed product. A bottom-up design challenge will always take the form "What would be a novel/fun/interesting card/mechanic/rule for this game? What could such a thing be?" Morph is a perfect example of a bottom-up design. R&D wanted to explore more opportunities for players to bluff and created the mechanic. Once it was determined fun enough to keep, the creative was set the task of determining what such a thing could look like in the world of Magic. So, how can Paradise Maiden—a card inspired by art—be a bottom-up design? While it's true that I started by answering the question "what is happening in this art" with "this creature is generating non-green mana," that raised the question "What would be a novel/fun/interesting creature that generates non-green mana?" And the answer was very mechanical in nature. 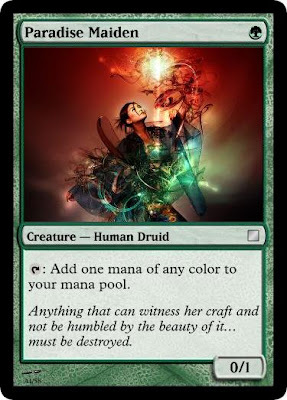 It's always been a curiosity that green's best mana producer (y'know, before Noble Hierarch and Lotus Cobra) has flying, an ability green has exactly zero of, ideally. I might have given Paradise Maiden 1 power to compensate for the loss of flying but that would make it strictly better than Llanowar Elves. While it's fine for a rare to be strictly better than a common, it's rather less fine to obsolete a staple classic that is already tournament-worthy. Additionally, at G 0/1 without flying, this feels like a good fit for uncommon which is actually kind of an exciting prospect for casual constructed players and for limited. The discussion of top-down designs is relevant, as some commentators have trouble with it, I think. Could you credit the artists on your cards, please? This one was inspired by the art, but you don't mention who painted it. Also, thanks for mixing up the paragraph that's "above the fold." It helps to distinguish the posts from each other.